Every now and then on the Criticwire Network an older film gets singled out for attention. This is Criticwire Classic of the Week. At this point, “Die Hard” has been so absorbed into the pop culture landscape that detailing the film’s plot or characters seems unnecessary. The story of a lone cowboy (okay, cop) heading out west to repair his marriage and unexpectedly going up against a whole host of foreign invaders has established the model for “the action movie” (incidentally by borrowing from the western genre template), complete with unlikely hero, single-minded mission, and a single location. “Die Hard” is an exercise in sustained, heightened tension, with McTiernan’s slick, precise direction lingering in small moments before exploding into big ones. McTiernan also highlights contrasts within the frame: The claustrophobia of Nakatomi Plaza versus its relatively vast size; the small size of John McClane (Bruce Willis) relative to Hans Gruber (Alan Rickman) and his gang versus his large presence in their hostage takeover; the internal chaos of Gruber’s plan gone awry versus the external chaos of government officials, media vultures, and other various competing agendas. Steven E. de Souza and Jeb Stuart’s impeccably structured script follows the golden “plot as a function of character” rule to a T, establishing multiple intertwined conflicts that propels the film forward at a brisk pace while grounding the proceedings in simple human desires, which are neatly emphasized by the film’s Christmas setting. “Die Hard” is “Die Hard” because it uses its simplicity to its advantage, which allows the complexity of the action sequences, the suspenseful pauses, and the human interactions to really shine. But what really sets “Die Hard” apart from its contemporaries, its antecedents, and its descendants is its insistence on rendering John McClane a human being rather than a superhero, something that later installments in the franchise unfortunately forgot. McClane may be a New York City cop, but he’s out of his element in the warm, friendly Los Angeles setting. He’s caught off guard when the shooting begins, as he’s making “fists with his toes” in the bathroom to get over jet lag which inevitably means he’s without shoes for much of the action. He doesn’t start by going up against Gruber’s men alone, he does everything in his power to alert the proper authorities and is appalled when they end up largely serving their own interests instead of helping the innocent. Despite his strong-arm behavior and his “yippie ki-yay”-ing, McClane never feels like a larger-than-life figure, even when he acts like one as a scare tactic over the radio. McTiernan and de Souza/Stuart go to great lengths to displace McClane from his natural state in the film’s first act, but they don’t immediately transform that behavior into heroics, choosing instead to use that displacement as a mechanism for him to methodically understand his surroundings. At the time of “Die Hard’s” release, Bruce Willis was known largely for his comedic leading man role in “Moonlighting,” not as an action star. Though that obviously changed with “Die Hard’s” success, what’s interesting is how Willis highlights the more “romantic” qualities of McClane, i.e. his fear and his frustration. Outside of the charged action scenes, the most compelling parts of the film are when McClane is screaming at himself or to no one in particular. He cries out in anguish when he sees police cars turn away from a crime scene in progress. Before he jumps off the roof of a building, he says to the heavens, “Oh God, please don’t let me die.” In arguably the best scene in the film, McClane winces at the sight of broken glass when he realizes he has to run through it barefoot to escape a firefight. These are small humanizing details that emphasizes McClane’s unlikeliness at a hero and allows the audience to accept McClane as their surrogate. It’s important that “Die Hard” allows its protagonist to devolve into a bloody mess over the course of film rather than maintain his action star persona. Rickman’s performance as Gruber gets the lion’s share of the performance credit, with his suave demeanor, menacing monologues, and perpetual sneer, but Willis provides “Die Hard” with human definition, creating a character that at one point seemed like a normal guy thrown into a horrible situation. “Die Hard,” the movie that gambles a $5 million salary on Bruce Willis, has to be the most excessive film around. It piles every known element of the action genre onto the flimsy story of a New York cop who rescues hostages from a Los Angeles office tower on Christmas Eve. Partly an interracial buddy movie, partly the sentimental tale of a ruptured marriage, the film is largely a special-effects carnival full of machine-gun fire, roaring helicopters and an exploding tank. It also has a villain fresh from the Royal Shakespeare Company, a thug from the Bolshoi Ballet and a hero who carries with him the smirks and wisecracks that helped make “Moonlighting” a television hit. 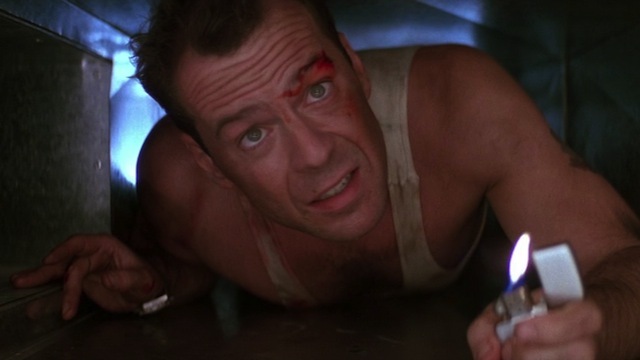 The strange thing is, it works: “Die Hard” is exceedingly stupid, but escapist fun. Read more. “Die Hard” is the template of the modern action movie, with an influence that extends far beyond the never-ending series of “‘Die Hard’ on a…” thrillers that it directly inspired. The shrewd updating of the lone, gunslinging “cowboy” as a put-upon, scrappy hero; the pack of Eurosleaze villains; the single prominent location; the high-tech hardware; the smug wisecracks; the gleaming widescreen photography. Before the imitators tapered off during the CGI and Marvel takeover, it seemed like every action spectacle was trying to be “Die Hard,” but the slow drift of its sequels alone is a good indicator that something was lost in the facsimile. The simplicity of the original film is deceptive: There are, in fact, many moving parts — an abundance of supporting characters and twists, subplots that need servicing inside and outside Nakatomi Plaza — but it never feels unwieldy. All the gears and springs of this thrill-machine are finely calibrated. Read more. Take John McClane, Willis’ sarcastic, soulful hero. While four sequels have weakened the character considerably, as originally envisioned, McClane is an antidote to muscle-bound behemoths and kung fu wizards, a badass who is still vulnerable to gunfire, punches, and, most memorably, broken glass. Where prior action films defined heroism as a stalwart ability to endure massive amounts of damage without notably suffering for it, “Die Hard” shows McClane as painfully, inescapably human. He accomplishes more than an actual human being could probably survive, but the fact that the movie never tries to hide each fresh hurt makes implausibility a moot point. McClane isn’t a super genius or a mutant; he’s just a good man determined to save his wife and catch (well, kill) some crooks. The distinction may seem like a small one, but the character’s lack of titanium bones or a Schwarzeneggerian physique gives even the film’s most outlandish stunts weight and consequence. Read more. Still, its the film’s subtext that will probably make it a success, though that subtext is also its most disturbing aspect. Like the “Rambo” films, “Die Hard,” though it operates with much more sophistication and subtlety, is driven almost entirely by buried, blind resentment. The blue-collar rage embodied by McClane is directed alternatively toward feminists (McClane’s wife has left him to pursue her career), yuppies (Hart Bochner turns up as a subsidiary, cocaine-snorting heavy), the media (William Atherton as a ruthless TV reporter), authority in general (the FBI and the L.A. police officials are portrayed as smug idiots) and any and all foreigners, though especially the job-threatening Japanese and Germans. The campy, incompetent “Rambo” was easy to laugh off; the far more professional “Die Hard” is harder to shake. It’s Morton Downey Jr. on a big budget-a piece of entertainment, but also a symptom. Read more. A serviceable if rather overextended and overblown adventure thriller, with Willis stripped for action like Rambo and doing his best as the only hope of the hostages held captive, this features a spectacular Cecil B. De Mille-like conclusion and makes good use of its skyscraper set (portions of which exhibit a Frank Lloyd Wright influence), but the script by Jeb Stuart and Steven E. de Souza, adapted from Roderick Thorp’s novel “Nothing Lasts Forever,” is fairly routine, and most of the wit consists of showing the naivete of police and FBI officials outside and characters calling one another dickhead. Read more. On a technical level, there’s a lot to be said for “Die Hard.” It’s when we get to some of the unnecessary adornments of the script that the movie shoots itself in the foot. Willis remains in constant radio contact with a police officer on the ground (Reginald Veljohnson) who tries to keep his morale up. But then the filmmakers introduce a gratuitous and unnecessary additional character: the deputy police chief (Paul Gleason), who doubts that the guy on the other end of the radio is really a New York cop at all. As nearly as I can tell, the deputy chief is in the movie for only one purpose: to be consistently wrong at every step of the way and to provide a phony counterpoint to Willis’ progress. The character is so willfully useless, so dumb, so much a product of the Idiot Plot Syndrome, that all by himself he successfully undermines the last half of the movie. Thrillers like this need to be well-oiled machines, with not a single wasted moment. Inappropriate and wrongheaded interruptions reveal the fragile nature of the plot and prevent it from working. Without the deputy chief and all that he represents, “Die Hard” would have been a more than passable thriller. With him, it’s a mess, and that’s a shame, because the film does contain superior special effects, impressive stunt work and good performances, especially by Rickman as the terrorist. Here’s a suggestion for thrillermakers: You can’t go wrong if all of the characters in your movie are at least as intelligent as most of the characters in your audience. Read more.